Robert "Bob" Rozakis (/rəˈzækɪs/; born April 4, 1951) is an American comic book writer and editor known mainly for his work in the 1970s and 1980s at DC Comics, as the writer of 'Mazing Man and in his capacity as DC's "Answer Man". Bob Rozakis got his start in the comics industry through his many letters to comic book letter columns. Among his earliest credits is that of editor on DC Comics "Pro-zine" ("Professional fanzine") The Amazing World of DC Comics between 1974 and 1978. In addition to editing, Rozakis wrote for the bi-monthly publication and oversaw the letters page. He is known as DC's "Answer Man", answering trivia questions from readers in the Daily Planet promotional page in many late–1970s comics and he has had an online presence in that capacity since the mid-1990s. Other pen names used by Rozakis are Boris Zabok and Ted P. Skimmer. His first comics credit was in Detective Comics #445 (March 1975), as writer of the back-up feature "The Touchdown Trap", with back-up stories in Action Comics, The Flash and Batman Family soon following. He was assistant editor to Julius Schwartz on issues of Action Comics, Detective Comics, and Superman. His writing credits consist largely of back-up features, especially for Action Comics featuring Air-Wave, Aquaman, and the Atom. Rozakis stated in a 2014 interview that "I don't recall how we ended up with the three of them. It may have simply been that all three had names that began with 'A' and it was a backup in Action Comics". In 1976, Rozakis and Paul Levitz co-wrote a revival of the Teen Titans. Among his characters he created during this time are Duela Dent; the Bumblebee; and the Calculator, a character who later played a major role in DC's Identity Crisis limited series. He revived Batwoman and the original Bat-Girl. Rozakis and artist Juan Ortiz crafted an origin for the Teen Titans in issue #53 of the series. He and artist Dan Spiegle created the character Mister E in Secrets of Haunted House #31 (Dec. 1980). Rozakis wrote seven stories for the "Whatever Happened to...?" backup feature in DC Comics Presents in 1980 and 1981 and the Superman: The Secret Years miniseries in 1985. He scripted the comics adaptations of such movies as Rainbow Brite and the Star Stealer (1985), Superman IV: The Quest for Peace (1987), and Bill & Ted's Excellent Adventure (1989). He was the writer of the syndicated comic strip The Superman Sunday Special for two years. His most well-known writing came in the twelve-issue 1986 series 'Mazing Man, featuring the misadventures of self-declared homemade hero Sigfried Horatio Hunch III, which Rozakis co-created with artist Stephen DeStefano. The two returned to the character for three specials and for Secret Origins #16 (June 1987), to tell "The Closest Thing To A Secret Origin of 'Mazing Man You Will Ever Get". Rozakis co-created the series Hero Hotline with DeStefano, on which Rozakis provided the coloring. Rozakis' comic book work in 1998–2000 was a variety of custom publications including the "Celebrate the Century" comic books for the United States Postal Service, as well as publications for Con Edison, the San Francisco Giants and the United Nations Land Mine Awareness program. In 2008, he began writing a series of "alternate reality" articles titled "The Secret History of All-American Comics Inc." for Alter Ego and Back Issue! magazines. Between 1981 and 1998, Rozakis ran DC Comics' production department, and as Executive Director of Production he was instrumental in the development of offset-printed comic books in a wide variety of formats. He was the leading proponent of "computerized color separations and typesetting, electronic page preparation, and computer-to-plate printing", and as a result of his efforts on DC's behalf, the look of comic books across the entire industry changed, DC won "over one hundred awards for printing excellence", and Rozakis himself was profiled in Publishing & Production Executive on two separate occasions. In 2003, Rozakis announced his retirement from the comic book industry. Rozakis is married to prolific author Laurie E. Rozakis, a professor of English, grammar expert and "author of more than 100 books", and Bob Rozakis' co-writer on Detective Comics #464 (Oct. 1976). The two have collaborated on The Complete Idiot's Guide to Office Politics They have two children: son Charles "Chuck", who wrote his Princeton University thesis on the business viability of webcomics, and daughter Samantha "Sammi". In 1973, Laurie and Bob drove the DC Comicmobile, a van which sold comic books "like the ice cream man did". ^ Contino, Jennifer M. (January 2001). "The Answer Man Bob Rozakis". Sequential Tart. Retrieved September 5, 2015. I started doing the chatroom in 1996 because I saw it as a way for DC staff people to be in direct contact with the fans. ^ Rozakis, Bob (September 24, 2009). 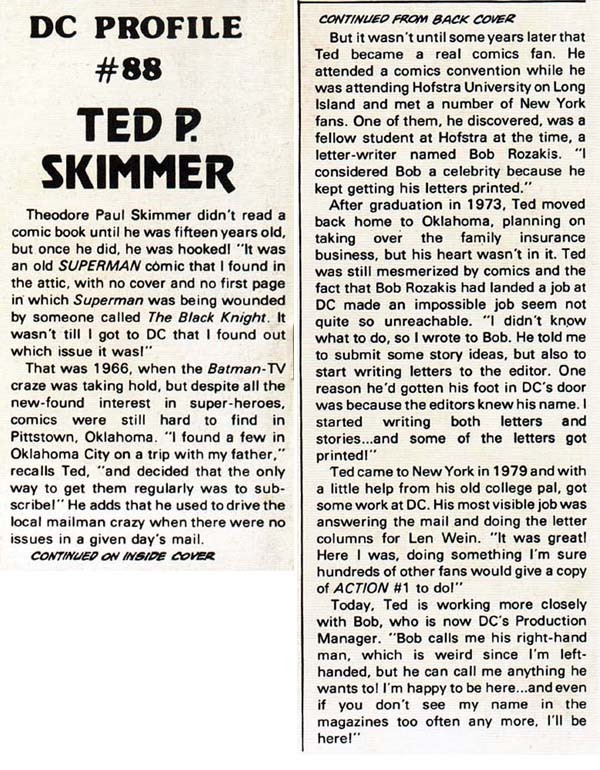 "Ted P. Skimmer and Me". Anything Goes. Archived from the original on March 28, 2012. Retrieved March 27, 2012. Ted does not exist. In fact, everything he wrote was actually written by yours truly. ^ Trumbull, John (October 2014). "Shrinking Roles and Shorter Features: The Atom in the Bronze Age". Back Issue!. Raleigh, North Carolina: TwoMorrows Publishing (76): 27–28. ^ a b c Rozakis, Bob (November 24, 1998). "The Bob Rozakis Home Page". Archived from the original on July 26, 2008. Retrieved March 27, 2012. ^ Manning "1970s" in Dougall, p. 123: Detective Comics #463 "The second villain to debut in this issue was the Calculator...written by Bob Rozakis and drawn by Mike Grell." ^ Manning "1970s" in Dougall, p. 125: Batman Family #10 "The original Batwoman, Kathy Kane, made her first appearance in the Bronze Age of comics...in this story by writer Bob Rozakis and artist Bob Brown." ^ Manning "1970s" in Dougall, p. 127: Teen Titans #50 "The time was ripe for [Batwoman's] sidekick, Bette Kane, the original Bat-Girl, to return from comic book limbo. In an adventure written by Bob Rozakis and drawn by Don Heck, Bat-Girl came out of retirement." ^ Manning, Matthew K. "1980s" in Dolan, p. 189: "In the last feature of its thirty-first issue, a story by writer Bob Rozakis and artist Dan Spiegle, a new monster hunter named Mister E was introduced." ^ Wells, John (May 2013). "Flashback: Whatever Happened to...?". Back Issue!. Raleigh, North Carolina: TwoMorrows Publishing (64): 51–61. ^ a b Rozakis, Laurie (September 26, 2008). "Adventures with Sammi!". Test Success: Grammar, She Wrote. Archived from the original on March 28, 2012. Retrieved March 27, 2012. We were able to go because Sammi held me up, especially up and down the stairs. What a wonderful daughter! ^ Rozakis, Laurie; Rozakis, Bob (1998). The Complete Idiot's Guide to Office Politics. New York, New York: Alpha Books. p. 320. ISBN 0-02-862397-5. ^ Rozakis, Charles (April 9, 2003). "An In-Depth Look at the Business Viability of Webcomics" (PDF). Princeton University. Archived from the original (PDF) on February 23, 2005. Retrieved March 27, 2012. ^ Hamlin, Brad (August 2011). "Mystery Island Interviews DC Comics Super Alumni Bob Rozakis". Archived from the original on March 28, 2012. Retrieved March 27, 2012. Wikimedia Commons has media related to Bob Rozakis.